Published: July 15, 2014 at 02:49 p.m. Updated: July 16, 2014 at 06:01 p.m. I'm a product of the 1980s. "Star Wars." Denim jackets. Trivial Pursuit. Hair metal. Speaking of rock 'n' roll, who remembers Tesla's cover of "Signs"? You know, "signs, signs everywhere there's signs ... do this don't do that, can't you read the sign?" Whether it's back in the '80s or now, signs are all over the place. Even in fantasy football. You don't need a shirt and a tie to get a seat, just check out these draft signs for 2014. 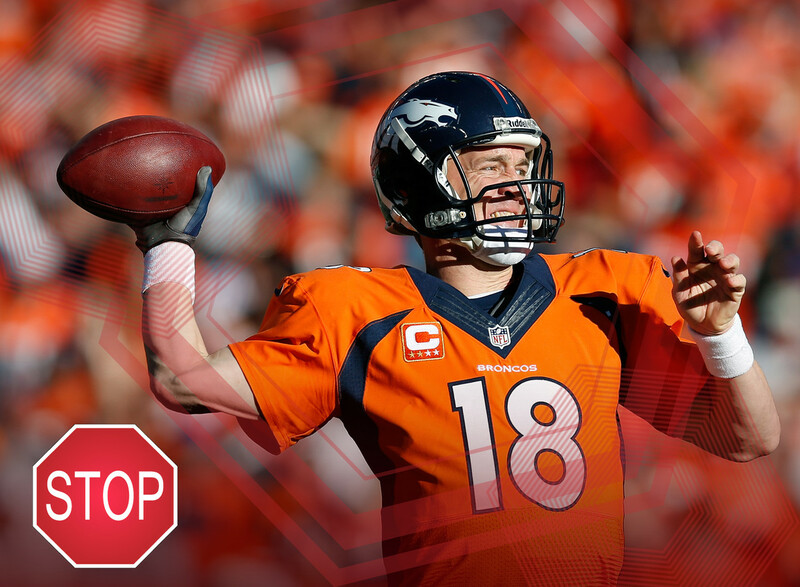 I'm not telling you to avoid Manning altogether, but I am telling you not to take him in Round 1. I know he scored more fantasy points than anyone last season, but does that guarantee him similar production in 2014? Well, keep in mind that no quarterback in NFL lore except Drew Brees has thrown for 5,000-plus yards or 40-plus touchdown passes in back-to-back campaigns. Also, waiting on a deep quarterback spot makes sense. I am on board with Ball breaking out, and that has a lot to do with Manning. The top backs in his offenses have averaged over 1,500 scrimmage yards and double-digit touchdowns, a list that includes Edgerrin James, Joseph Addai and Knowshon Moreno. All offseason camp reports surrounding Ball have been ultra positive, meaning a featured role is well within his grasp. In a 12-team league, Ball has late first-round value. Every year, we wait for McFadden to fulfill the statistical expectations he entered the league with back in 2008. And every year (sans 2010), he fails to meet those expectations. McFadden's dark cloud at the pro level has been his proneness to injuries, which have limited him to 29 games in the last three seasons. With Maurice Jones-Drew now in Oakland, the Arkansas product can't be drafted as much more than a No. 5 runner. Harvin has all the talent in the world, but he's been unable to utilize those talents due to injuries over the last two years. In that time, he's played in just 10 games due to various ailments. While he is expected to be fine for the start of camp, whether or not he stays healthy remains to be seen. Also, the trend of big-name wide receivers coming to the Great Northwest and failing to produce strong numbers is a cause for concern. Sankey's skill set isn't under construction, but his value in fantasy land is still to be determined (or built). He failed to impress his coaches (or fantasy owners) in the preseason and remains behind the combination of Shonn Greene and Dexter McCluster on the depth chart. The rookie out of Washington could turn into quite the fantasy draft bargain if he sees the field later this eyar. Of course, any potholes in his path to the top spot on the Titans depth chart would turn Sankey into this year's Montee Ball circa 2013. Last season, Moreno was the ugly duckling who turned into a swan. Heading into 2014,, I think his most recent campaign will be his "swan song." The fifth-best runner based on fantasy points in '13, Moreno is at best splitting carries with Lamar Miller for the Dolphins. Coming off a bad offseason that saw him leave Peyton Manning and require an arthroscopic knee procedure, Moreno is someone to avoid in most drafts until the later rounds. You love Watkins' skills, his upside and the fact that he's likely the top wide receiver in Buffalo. Or maybe you're higher on Mike Evans or Brandin Cooks. Tap the brakes, my friends, because most rookie wideouts don't make a huge impact. From 2009-2013, 154 wide receivers have been drafted. Of those 154, just six have had1,000-plus yards. Furthermore, only two rookie wideouts have hit that mark in the last seven years. Johnson, 33, could come with some drama this season. He's had made it public that he wanted to be traded (a request the Texans did not oblige), and he has sat out much of training camp and the preseason with a hamstring injury. Johnson should still be considered as a No. 2 fantasy wideout in standard formats, but he still comes with some risk. Richardson the rookie and Richardson the NFL sophomore looked like two different players. The Alabama product rushed for two yards or fewer on almost 54 percent of his carries, and finished 33rd in fantasy points among running backs last season. Those are scary bad totals. So while he's still young at the age of 23, you can't take Richardson as more than a high-end flex starter. He's the poster boy for being cautious in drafts. Johnson finished ninth in fantasy points among running backs last season, but he was one of the more inconsistent performers at his position. Now in the Big Apple, Johnson is entering his age-29 campaign with a short ceiling. In fact, he's no lock to post his seventh straight 1,000-yard season in 2014. An increase in age, a massive career workload and a decline in yards per carry (3.9 in 2013) are a bad combination.